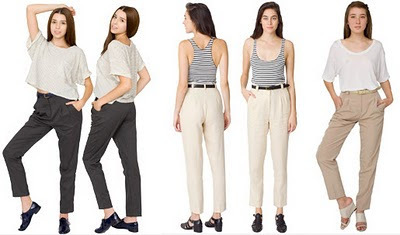 And, more specifically, American Apparel's high-waist pleated pant with a nicely tapered leg. Don't shudder! I first spotted them on my friend Holly (in the khaki form -- very Annie Hall) and eventually decided I needed a gray wool pair for myself. Which I love and expect to wear 20 billion times through the winter. these always go in and out of style but they're such a classic...such a fall must for these simple times. I love the AA high-waisted pleated pants as well. Def on my list of needing items this season! Trouble is with pleated trousers is that, unless you have the waist like a supermodel...you look massive beyond your weight and they look especially horrid on men.